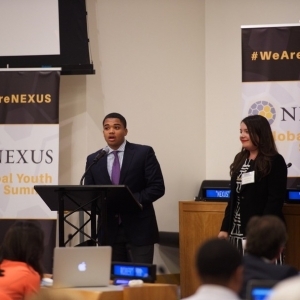 On July 24, 2014, Scarsdale's Maggie Dunne and former Scarsdale STEP graduate Keith Martinez spoke to a full house at the Nexus Global Youth Summit on innovative philanthropy and social entrepreneurship held at the United Nations. Maggie, the President and Founder of Lakota Children's Enrichment, a nonprofit she started while a student at Scarsdale High School, was invited to deliver a plenary address at the Youth Summit, and she invited Keith, who serves as the Chair of LCE's Youth Board, to share the stage! 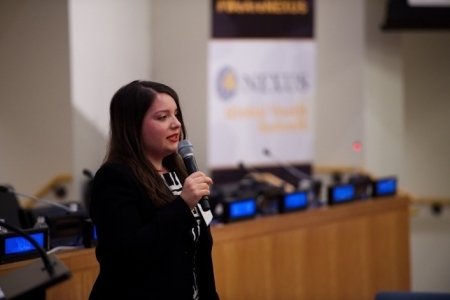 Maggie said: "The Nexus Summit presented a great opportunity to educate a global audience about the obstacles facing tribal communities in the United States, and I thought that attendees would gain a deeper understanding about the importance of our work if they heard directly from someone who has participated in our programs. 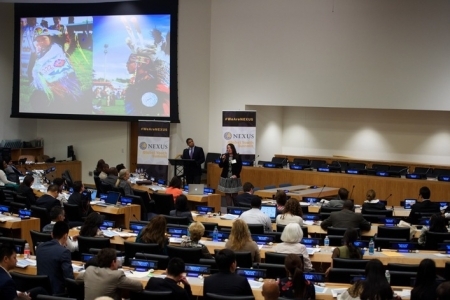 Keith has spoken at our Youth Summits and other events, but this was an opportunity to address an international audience of young philanthropists and business leaders. We anticipated that the house would be packed, which it was." 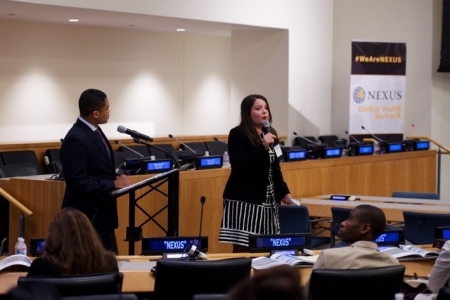 Keith said of speaking in the United Nations: "Speaking at the United Nations was an amazing experience that I will never forget! I was terrified every time I looked up from the podium and saw so many people watching and listening to my every word!" Dunne presented an overview of the conditions on the Pine Ridge Reservation in South Dakota, a community that the UN has called one of the most marginalized and historically wronged communities in the world. She explained how LCE's programs address low self-esteem, the high drop out rates and the youth suicide epidemic, by building a network of concerned teens, while providing mentorship, leadership skill development and opportunities for expression. Maggie Dunne described LCE's premiere programs (Annual Writing and Art Challenges, Youth Summits and the Youth Advisory Board) and said that LCE "fills gaps" caused by underfunded budgets, and works collaboratively with the community. "The next Zuckerberg, Jobs or Sandburg... might be among the youth we are working with [on Pine Ridge], but the doors to opportunities are closed." Keith Martinez told the Nexus audience that he became involved with LCE when he left the Pine Ridge Reservation to participate in the Scarsdale STEP program, and that his service with LCE has gained him two national awards (one from Youth Service America and another from the Center for Native American Youth). When Keith announced that he is a rising Junior at Villanova University, where he is a Presidential Scholar and a Gates Millennium Scholar -- the United Nations hall erupted into applause. Martinez said of his accomplishments, "None of this would have been possible without LCE's support and guidance-- allowing me to give back to my community and encouraging me to be proud of my heritage." Both Dunne and Martinez will speak again at LCE's Inaugural Fundraiser on Saturday, September 13th at Westerleigh in Greenwich CT, the stone estate of Steven and Diana Steinman. Nobel Peace Prize winner Jody Williams and Scarsdale's Brandon Steiner will be honored guests.